This is another small painting based on elements of the larger Glen Rosa drawings. In order to see any detail around me when I’m actually out in the hills and glens, I have to use a monocular. This gives a very narrow and flattened view of my surroundings and I like to use these rather clipped angles and compositions in some of my paintings. 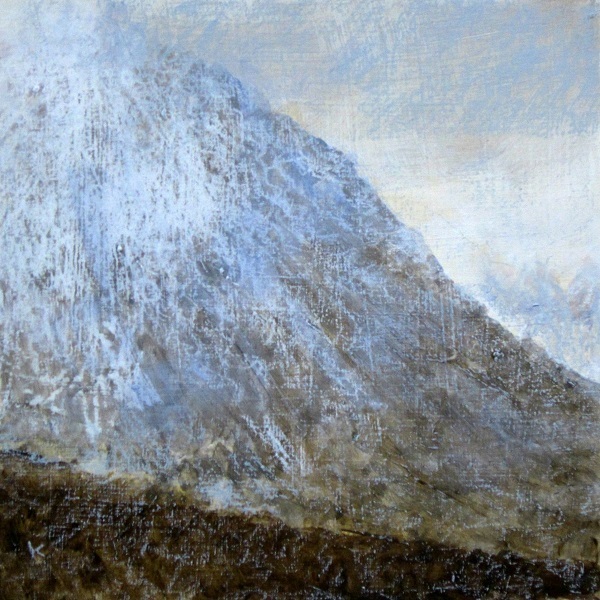 Six or seven years ago when I was out walking Ben Wyvis with my old mate and colleague, the sculptor Keith Barrett, I lent him my monocular and at that point he turned to me and said , ‘Now I see where your paintings are coming from….’. When you’re visually impaired you don’t just get the fuzzy view through your eyes ….you also get what ever view or angle is created through whatever equipment or technology you use as a visual aid ….over time this tends to distort how you see things ….or think you see things. It’s a different world as my partner says!